The crystallization process and physical properties of different functional oxide thin films (Ce0.9Zr0.1O2-y, LaNiO3, Ba0.8Sr0.2TiO3, and La0.7Sr0.3MnO3) on single crystal substrates (Y2O3:ZrO2, LaAlO3, and SrTiO3) are studied by pulsed laser annealing (PLA). A Nd:YAG laser source (λ = 266 nm, 10 Hz and τ ∼ 3 ns) is employed to crystallize chemical solution deposited (CSD) amorphous/nanocrystalline films under atmospheric conditions. We provide new insight on the influence of photochemical and photothermal interactions on the epitaxial crystallization kinetics of oxide thin films during the transformation from amorphous/polycrystalline material (i.e., atomic diffusion, epitaxial growth rates, and activation energies of nucleation and crystallization). The epitaxial growth is investigated by varying the laser fluence and the applied number of pulses. 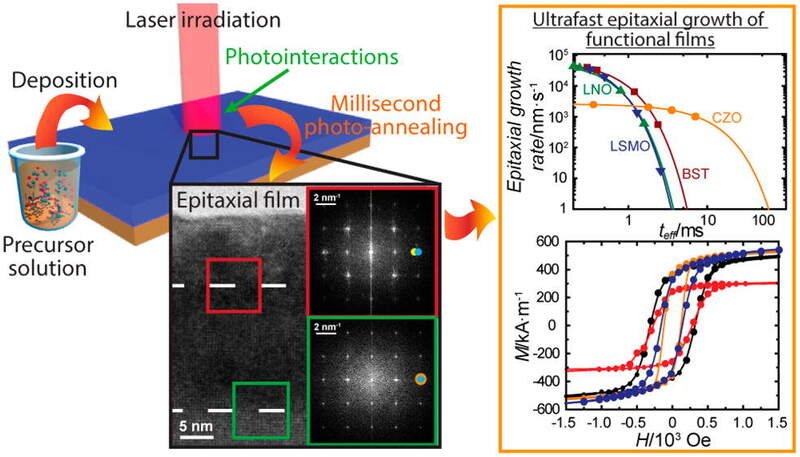 The morphology, structure, and epitaxial evolution of films are evaluated by means of atomic force and transmission electron microscopies and X-ray diffraction. Highly epitaxial oriented films of 20–40 nm in thickness are obtained by PLA. The crystallization kinetics of laser treatments is determined to be orders of magnitude faster than thermal treatments with similar activation energies (1.5–4.1 eV), mainly due to the large temperature gradients inducing modified atomic diffusion mechanisms derived mainly from photothermal interactions, as well as a minor contribution of photochemical effects. The fast heating rates achieved by PLA also contribute to the fast epitaxial growth due to reduced coarsening of polycrystalline material. The measurement of the physical properties (electrical resistivity and magnetism) of laser processed CSD films has revealed significantly good functionalities, close to those of thermally grown films, but with much shorter processing times.